Louis CK Will Return to HBO For New Stand-Up Special!!! Red-hot comedy star Louis CK will return to HBO next year in an all-new stand-up comedy special, it was announced today by Michael Lombardo, president, HBO Programming. To be taped at one of the stops of his sold-out 16-city tour, which wraps in February, the exclusive presentation will be his second hour-long special on the network and will be directed by Louis CK. I’m very excited about this. I recently saw Louis live in Dallas, and he was amazing. My cheeks hurt I was laughing so hard. I’m curious to see if any of his material makes it to the HBO special. 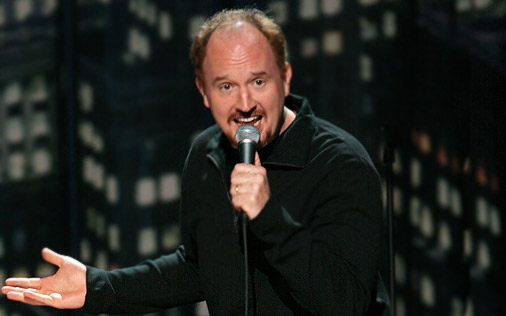 “I’m delighted to welcome the gifted Louis CK back to HBO,” said Lombardo. “This comic genius remains one of the freshest voices on the scene, and HBO is proud to provide an uncensored forum for his provocative humor.” Earlier this year, Louis CK won two Emmys®, for Writing for a Comedy Series for the FX series “Louie,” and Writing for a Variety Special, for “Louis CK Live at the Beacon Theatre.” On Nov. 3, he hosted “Saturday Night Live” for the first time. His previous HBO credits include the hour-long 2007 stand-up special “Louis CK: Shameless,” and two half-hour specials, a 1997 edition of “HBO Comedy Half-Hour,” and 2005’s “One Night Stand: Louis CK.” In addition to creating and starring in the 2006 series “Lucky Louie,” the network’s first multi-camera comedy series, he won an Emmy® as part of the writing team for HBO’s “The Chris Rock Show.” Louis CK also appeared with Ricky Gervais, Chris Rock and Jerry Seinfeld in the 2011 HBO special “Talking Funny.” Louis CK, Dave Becky and Blair Breard will executive produce the special. This entry was posted on Monday, November 12th, 2012 at 2:11 pm	and is filed under Events, Film, News, Television. You can follow any responses to this entry through the RSS 2.0 feed. You can skip to the end and leave a response. Pinging is currently not allowed. « Rosemarie DeWitt & Patton Oswalt Join HBO’s ‘Newsroom’!!! Captain Barbossa , I am here to negotiate the cessation of hostilities against Port Royal . There are a lot of long words in there, Miss; we're naught but humble pirates. What is it that you want? I'm disinclined to acquiesce to your request. Means "no". Very well. I'll drop it. Me holds are burstin' with swag. That bit of shine matters to us? Why? It's what you've been searching for. I recognized the ship. I saw it eight years ago on the crossing from England. Fine. Well, I suppose if it is worthless then there's no point in me keeping it. You have a name, Missy? Elizabeth... Turner. I'm a maid in the Governor's household. And how does a maid come to own a trinket such as that? Family heirloom, perhaps? I didn't steal it, if that's what you mean. Very well, you hand it over and we'll put your town to our rudder and ne'er return. [she hands it over] Our bargain? Still the guns and stow 'em, Signal the men, set the flags and make good to clear port. First, your return to shore was not part of our negotiations nor our agreement so I must do nothing. And secondly, you must be a pirate for the pirate's code to apply and you're not. And thirdly, the code is more what you'd call "guidelines" than actual rules. Welcome aboard the Black Pearl, Miss Turner.